Poodles are very smart, proud and active. They are very skillful, agile and acrobatic in nature and they performed excellently in many dog activities and sports. Poodles have won top honors and awards in conformation shows. Poodles won the World Dog Show that took place in 2007 and 2010 and the “Best in Show” in 1991 and 2002. They are also good assistant dogs and circus performers. Toy poodles are the smallest of the Poodles. They weigh between 6 pounds to 9 pounds. Adult top poodles are mostly 10 inches tall and their daily calorie requirement is 300. 300 calories per day are enough but if your poodle is less active, a calorie of 240 per day will suffice. However, if your toy poodle is energetic and very active, you will need to feed your poodle with about 465 calories of food daily. Next in size to the toy poodles are the miniature poodles. They are bigger than the toy poodles and the average adult miniature poodle is between 11 10 15 inches tall and weighs about 15 to 17 pounds. The daily requirement for less active miniature poodles that don’t exercise often, their daily requirement is 400 calories while moderately active miniature dogs will need just about 490 calories every day. On the other hand, the highly active dogs’ daily requirement is 780 calories upwards. These are the largest of the Poodle breed. When fully grown, they measure about 22 inches tall on average and the adults weigh within 45 to 70 pounds. The daily calorie requirement of the less active standard poodle is about 1,000 calories while the average dogs that have a regular amount of exercise need approximately 1300 calories per day. For poodles that are highly active, a daily requirement of 2000 calories will suffice for their normal functioning and healthy living. Given the wide weight range, it is very important to be observant and keep track of your standard poodle’s daily needs and give them the right quantity of food to supply their daily calorie need. When should I feed my Poodle solid food? To fuel the rapid growth of poodle puppies, they require lots of calories. Poodle puppies grow at a very fast rate in their first six months. During their first few weeks, they will get all the calories needed from their mother’s milk. When they are about four weeks old, they should be introduced to solid food so as to augment the calories derived from their mother’s milk. Most often, puppies less than 8 weeks old may need their dry food moistened to make it feel spongy. How Often Should I Feed My Poodle? Feed your puppies three times daily right from weaning through the fourth to sixth month. After the sixth month, feeding your puppies twice a day is okay. 3 months and below: it is important to know that puppies under 3 months old perform best when they are free fed. Feed them as often as they demand it but ensure the food is always fresh. Don’t cultivate the habit of topping their food throughout the day. Clean, wash and rinse their eating bowls to remove old food that might be stuck on the bowl before feeding again. 3 months upwards: puppies that are 3 months old should be fed 3 meals every day. Adult: adults can be given 1 meal per day but smaller dogs like the miniatures and toy poodles often perform well with 2 meals in a day. Standard poodles can conveniently do well with a meal per day (especially dinnertime feeding) however, splitting a meal into two servings can be of great benefit too. If your dog is always left at home during the day all alone, you can reduce its isolation by placing its food into the treat-release toys. Not all foods are good for your dog. Some of the common foods enjoyed by humans are quite dangerous to the health of dogs. To ensure the safety of your puppies, do not feed them macadamia nuts, chocolate, raisins, avocados, onions, milk, cheese, garlic, coffee, alcohol, caffeine, xylitol sweetened foods such as baked goods, candy, gum, toothpaste, etc. 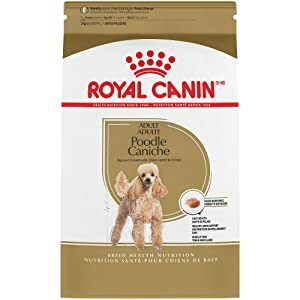 The Royal Canin has different varieties of food for the different types of poodles; from toy poodle to miniature and standard poodles. 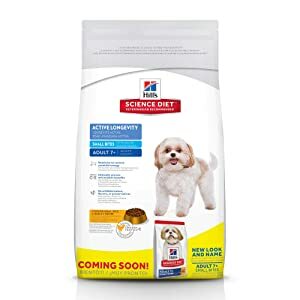 They have the dry food for the poodle puppies and both dry and wet poodle food for the adults and matured poodles. The foods comprise of beneficial and nutritional ingredients needed for healthy growth of poodles. It is high in protein content and also contains DHA necessary for mind strengthening. The food formula has ingredients such as Vitamin D3, Biotin, Vitamin B12, Vitamin E needed for additional support and teeth growth. 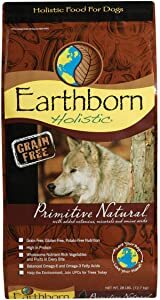 The Earthborn Holistic Primitive Natural produce high-quality dog food that supports fast growth and easy digestion. It does not contain gluten or grains. It comprises a chicken meal, whitefish meal and turkey meal that supply your dog with a rich amount of protein needed for growth. In addition, it contains a wide variety of vegetables (including peas, carrots, spinach etc.) and other fruits (like the blueberries and apples) that supply the need vitamin and antioxidants respectively. This is specifically made for mature poodle dogs of age 7 years or older. It is not recommended for pregnant or nursing dogs and puppies. It is fortified with a complete diet needed for your matured dog. It is rich in antioxidants and nutrients needed to restore the youthful energy and strength needed by your dog. It is has a great taste and it is highly digestibly. It boosts the immune system with the high amount of vitamin C and vitamin E present in the formula. The formula is made from natural ingredients and there are no artificial dyes or colors, synthetic flavors, or preservatives. This dog food produced from Orijen comprises six different fish types (Fresh pacific pilchard, hake, mackerel, rockfish, flounder and sole). 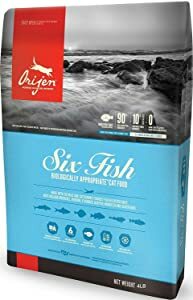 With the appropriate amount of nourishing proteins and low-glycemic carbohydrates, ORIJEN SIX FISH is can be fed to dogs at any life stages with the consideration of their biological and evolutionary needs. The food formula is natural and has no chemical preservatives. 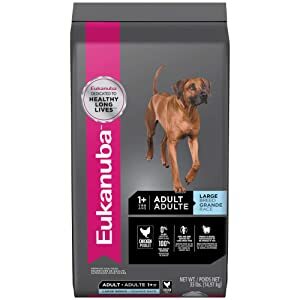 The Eukanuba dog food supplies your dog with the balanced diet requirement needed for growth. Its major protein source is from lamb. The formula is fortified with chondroitin and glucosamine which promotes strong bones and joints. It contains prebiotic FOS and pulp for healthy fiber development and omega fatty acid for coat growth.